It has long been my contention that he was a brilliant engineer and organizer and headed the type design department at ATF, but I doubt if he ever actually took a pencil to paper and drew any of the typefaces that he is given credit for. … I have been trying for the past three decades to find anything that would confirm that M. F. Benton actually drew any designs and have come up short. On May 25, 1948, Morris Fuller Benton wrote a letter to Loomis Burrell for the Little Falls (New York) Public Library file about his grandfather, father and himself. Little Falls had been the birthplace of Linn Boyd Benton, and even today, the Little Falls Historical Society Museum houses many original documents about the Benton family. At the end of the letter, Morris states: “I retired from my association with the American Type Founders Company in 1937. At present I am contemplating the compilation of a list of type faces designed or redesigned by myself, as all such lists heretofore published are incomplete.” But Morris died on June 30, 1948 after a brief illness. 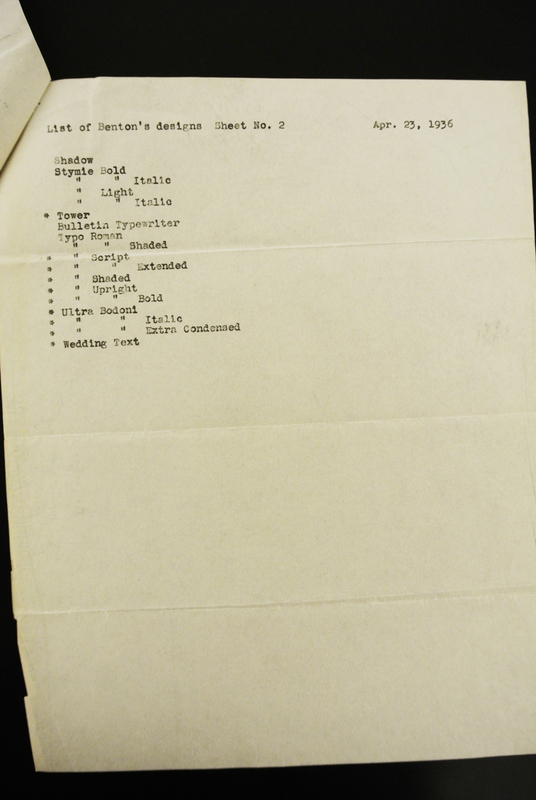 Twelve years earlier, Morris had compiled what he called a partial list of his type designs (there are 101 typefaces on the list, shown below) in a two-page letter to Harold Kathman of ATF’s Sales Promotion Department. In front of 52 typefaces he put asterisks indicating, as he explained, the ones that could be selected for a shorter list if the whole list was too long for Kathman’s purposes. A carbon copy of this letter is housed in the Cary Graphic Arts Collection at RIT. 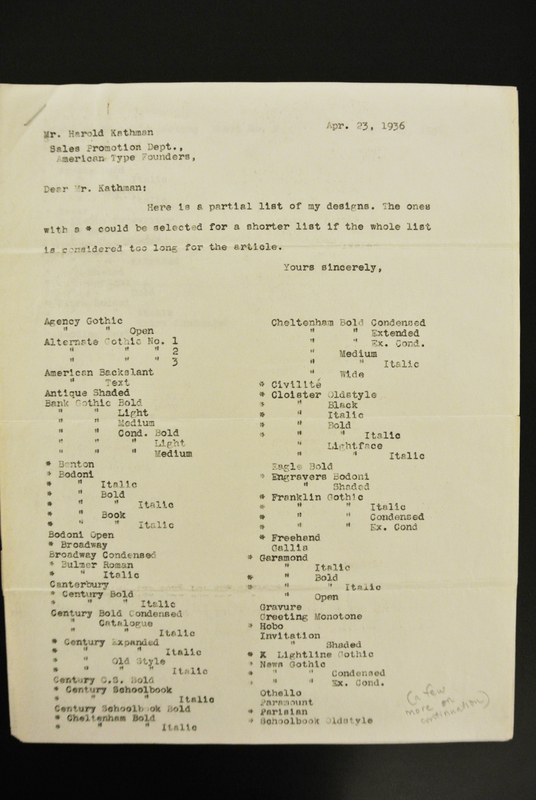 The list likely identifies the typefaces that Benton considered his best or most significant. He had no apparent reason to lie about designing these typefaces. Many of his types are not on the list, including his variations for the Goudy Old Style family, although both Mac McGrew (American Metal Typefaces of the Twentieth Century) and Stevens L. Watts (in charge of ATF type sales and production of new typefaces from 1948 to 1955) attribute nine Goudy Old Style variations to Benton. Morris Benton did not always have, as von Holdt assumed, “a whole department of designers, artists and engineers under him.” This is a huge issue. Getting philosophical, Michelangelo had a lot of assistants, but his work is still his. In the same way, Benton had assistants but he was still in charge. Typefaces originated by other ATF employees or independent type designers were noted as such in many of the typeface lists. And when Benton had assistance with a typeface, that is noted too. There was no “secret” designer lurking in the background doing all the work. Benton started at ATF helping his father with his inventions, and then was assigned the task of standardizing the various type lines that ATF had acquired from the type foundries in the 1892 merger which created the company. He also helped his father design Century Expanded and Century Expanded Italic (both released in 1900). Before being put in charge of the type-designing department at ATF in Jersey City in 1903, Morris already had designed several of his own (Wedding Text, 1901; Franklin Gothic, 1902; and Cloister Black, before 1903). VonHoldt doubts that Morris Benton “ever actually took a pencil to paper and drew any of the typefaces he is given credit for.” But some of Benton’s working drawings still survive. A Typographica Internet thread on ATF contains this note by Ed Bertschy from March 7, 2005: “As far as I know, I digitized the first font to have automatic optical hinting. The font was ATF’s Wedding Text, and Henry Schneiker developed and programmed the hinting. This was 1989 when I worked for the software division of Kingsley ATF in Tucson, AZ. I worked with the original Benton drawings ….” The Font Bureau website gives this history: “In 1908, faced with the welter of san serifs offered by ATF, Morris Fuller Benton designed News Gothic, a 20th century standard. In 1995 Tobias Frere-Jones studied the original drawings, which survive in the Smithsonian, and advanced the design.” And RIT’s Cary Graphic Arts Collection has a complete set of what are identified as Morris Benton’s working drawings for Bodoni. William Gregan, a contemporary of Benton’s at ATF, remembered that Benton “wouldn’t say two words, when none would do.” That’s why it’s notable in Benton’s letter to Kathman that he chooses to call the faces (both revivals and others like Century Schoolbook, Franklin Gothic and News Gothic) “my designs.” He does not include faces that were based on the designs of others. We may not have evidence that Benton drew every draft of these typefaces with his own hand, but we have no reason to believe that they aren’t his. Keep in mind that this was a partial list in 1936. Certainly there were more. I cover this in far greater detail in my book. Patricia A. Cost, The Bentons: How an American Father and Son Changed the Printing Industry (Rochester, NY: Cary Graphic Arts Press, 2011).